Dori is the son of Dorival Caymmi and Stella Maris, both famous Brazilian musicians. He began playing piano at age eight, studying under Lúcia Branco and Nise Poggi Obino. He studied music theory at the Conservatório Lorenzo Fernandez, and in 1959 made his professional debut accompanying his sister, Nana. In 1960 he became a member of the “Grupo dos Sete”, who wrote music for plays aired on Brazilian television. He co-directed and played violão in the play Opinião (1964), a transitional work between the styles of bossa nova and MPB. He directed Arena Conta Zumbi in 1966, and worked as a producer during this time as well, for Edu Lobo, Eumir Deodato, and Nara Leão (all recording for Philips Brazil). 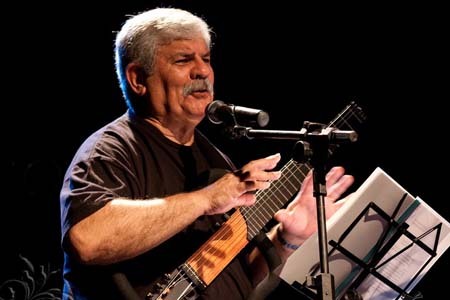 He and Nelson Motta wrote the song “Saveiros”, which, performed by Nana Caymmi, won the national prize and came in second for the international prize of the IFIC (International Song Festival) held by TV Rio. They continued to partner as songwriters for several years, writing some of Brazil’s biggest hits. He played and toured with Paul Winter and arranged and directed albums by Caetano Veloso, Gal Costa, and Gilberto Gil. He was involved with many musicians associated with the tropicalia movement of the late 1960s, but did not record in this style himself due to his distaste for Euro-American pop music. He wrote scores for numerous films and television shows in the 1970s and 1980s, and in 1989 he moved to Los Angeles. He has since played or recorded with Dionne Warwick, Toots Thielemans, Marilyn Scott, Oscar Castro-Neves, Eliane Elias and Edu Lobo. He was involved with a collaboration celebrating Tom Jobim at Carnegie Hall in 1995, and arranged the music for Clockers. Caymmi’s 1999 album, Cinema: A Romantic Vision, was nominated for Latin Grammy’s Best Arrangement for his rendition of Henry Mancini’s “Pink Panther”. The recording also featured covers of Rodgers & Hammerstein’s “My Favorite Things”, John Barry’s theme to the James Bond films, and R. Kelly’s “I Believe I Can Fly”. Influências was nominated for a Latin Grammy for Best Contemporary Brazilian album in 2001. Some of its songs pay homage to his father – “La Vem A Baiana” and “Acontece Que Eu Sou Baiano”. Contemporâneos, recorded in 2003, was nominated for a Latin Grammy for Best Contemporary Brazilian album. His 2013 album Caymmi, with siblings Nana Caymmi and Danilo Caymmi, was nominated for the 2014 Latin Grammy Award for Best MPB Album. In 2015, he was nominated for the Latin Grammy Awards again, this time with Mario Adnet and for the Best MPB Album and Producer of the Year categories, for producing the album Centenário Caymmi.